"At The Artichoke Restaurant in Old Amersham," writes Claire Bunting of Amersham, Buckinghamshire, "we had a fantastic watercress soup with a mushroom beignet. I've never had soup like it. Is the chef willing to share the recipe?" Laurie Gear, chef-director of The Artichoke, kindly obliged. Sweat the potatoes and onions in the oil in a large pan on a medium-low heat. When the onions are soft, add the stock. Simmer until the potatoes are soft. Remove from the heat. Add the watercress to the hot stock and leave for 3 minutes to wilt. Purée. Make the beignet: finely chop the mushrooms in a food processor. Heat the olive oil in a pan over a medium heat and sweat the shallot and garlic until soft. Add the mushrooms and cook until their liquid evaporates (about 25 minutes). Season, cool then roll into 8 balls the size of small eggs. Pour boiling water over the spinach leaves to wilt them. Dry the leaves on kitchen paper, then wrap 2 leaves around each mushroom ball. Make the batter: mix the sugar, yeast and a pinch of salt with 150ml warm water, add to the flour and leave in a warm place for 30 minutes. Heat vegetable oil in a deep pan to 175°C or until a cube of bread turns golden in 30 seconds. Dip the mushroom balls in flour, then in the batter and fry for 2-3 minutes until golden. Drain on kitchen paper and keep warm. Reheat the soup and pour into a jug. 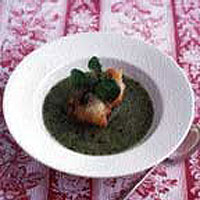 Put the beignets in warm bowls and serve, so each guest can pour soup around their beignet.